If drivers weren’t plentiful at the McLean station Monday, cyclists were. By the time Cecilia Clavet arrived at the station, most of the bike racks were occupied, forcing her to double up. 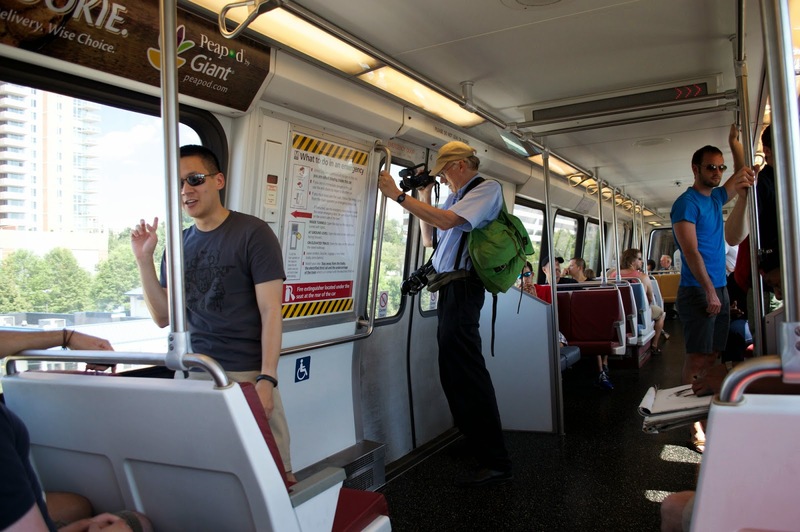 Usually Clavet, a policy adviser for the Nature Conservancy, drives 10 minutes to the West Falls Church station, where she parks and hops on an Orange Line train. But with the McLean station just down the hill from her home, she rode in. Her route didn’t include any major roads such as Chain Bridge Road or Route 7. Still, she said, the county could make the roads more bike-friendly. “There weren’t any bike paths, and I’m not used to riding a bike in traffic, so it was a little bit nerve-racking,” she said. Wiehle bike room at around 8:30am. October, according to Charlie Strunk, Fairfax County’s bicycle coordinator. The Board of Supervisors is expected to consider it later that month. But Strunk said some improvements have been put in place, including the addition of bike lanes to Gallows Road. Mariano Gutierrez pulled up to the bike rack at the Spring Hill station about 9:15 a.m. — his first time biking to a Metro station. He was pleased but said he hopes the county will do a better job of delineating bike lanes, particularly because Tysons is not a particularly bike- friendly area. He also wondered whether officials had done enough to make drivers aware there would be more cyclists on the roads. People will ride to the stations if it's safe and convenient. Bike access to the Wiehle station is relatively good and bikers are flocking there. This mooring at just after 8am the 16 racks outside the Wiehle bike room were nearly full as were the 10 racks on the south side of the station. Once the free racks regularly fill, I assume many people will want to join the bike room, which works out to about 25 cents/day for regular commuters. It's not too early for WMATA and Fairfax County to figure out how to add bike parking at the Wiehle-Reston East station. Fairfax County and VDOT need to expedite construction of bike facilities to all the new stations. Signage is needed for cyclists and motorists such as sharrows and Bicycles May Use Full Lane signs. People biking to the stations reduces congestion, relieves the need for additional car parking, and is good for so many other reasons. Today was the first weekday service for the Silver Line. At around 8 a.m. there were already a large number of bikes parked in the Wiehle station bike racks. There was a bike parked in every rack at the free bike parking just outside the bike room. Each rack holds two bikes so there was still room for more bikes. I believe there are 16 racks in that space. There were several bikes parked in the secure bike room although there was room for many more. 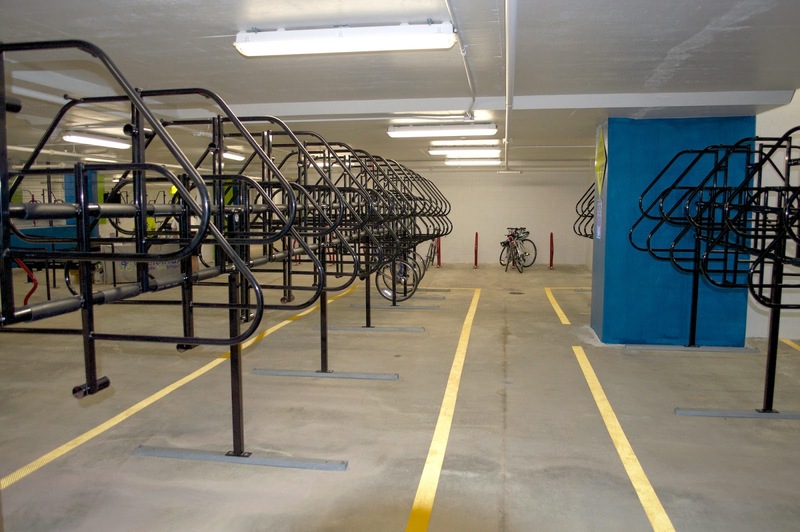 The room can hold over 200 bikes, and the racks can be reconfigured to hold additional bikes by replacing the single inverted U racks with the vertical racks. On the south side of the station there are 10 U racks and there was a bike parked at nearly every rack. Again, there was room for additional bikes. See photos on the right, all of which were taking this morning at around 8 a.m. It looks like there is considerable demand for bike parking at the Wiehle station. 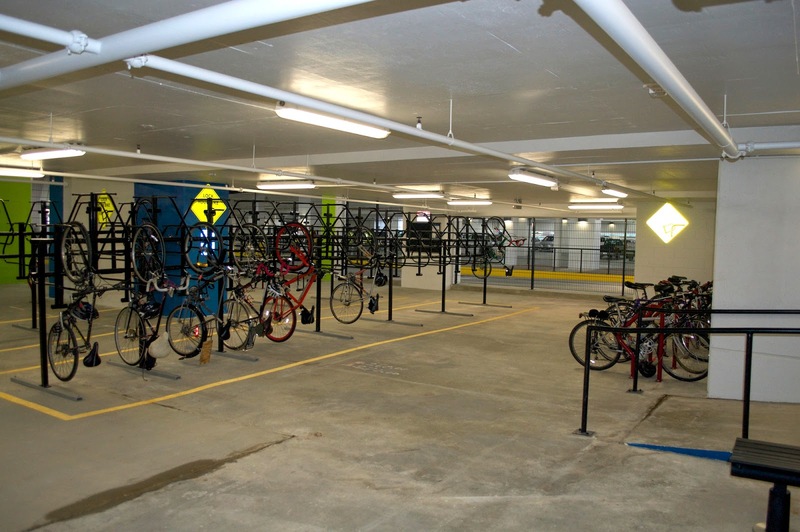 For those who cannot find free parking, the bike room works out to costing around 25 cents/day if you use it on a daily basis ($60/year plus one-time $15 processing and fob fee). Eventually there will also be several bike racks installed on the plaza outside the station entrance. The one comment I heard was from a woman who said that the bike room entry door was a little hard to hold open while walking a bike. An automated or auto-assist door would be much easier for cyclists entering the room. 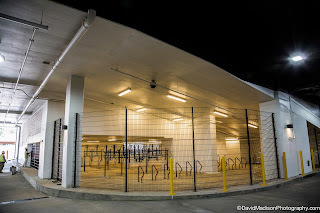 WMATA is renting the bike lockers at the Wiehele and Tysons stations with the exceptions of those lockers on the north side of the Spring Hill station that are located on county property. This is the last message we heard from WMATA regarding rental of those lockers: "We are not ready to sign up bike locker patrons." Not sure what the problem is since the lockers are in place and seem ready to be used. provide the additional free parking. We just learned about a public meeting tonight, July 28, on a proposal to create bike lanes on Ridge Top Road. The meeting starts at 7:30pm at Fairfax County Government Center, Conference Rooms 2-3. Ridge Top Road extends parallel to Waples Mill Rd from Random Hills Rd to Route 29/Lee Hwy. We encourage cyclists to attend the meeting to support this project that will help reduce speeding, add on-street parking, and add bike lanes. VDOT and Fairfax County Supervisor Cook have heard concerns from the community surrounding Ridge Top Road: there is not enough on-street parking, there is too much speeding, and the road is not bicycle friendly. VDOT is considering ways to change the pavement markings to address these concerns and we want the community's input before taking any action. There will be an open informational meeting for anyone interested in learning about the plans for a road diet and lane restriping along Ridge Top Road. Representatives from VDOT and Fairfax County DOT will be there to talk about the project and to explain how this will affect traffic patterns in the area. In particular, Ridge Top is currently marked with two lanes in each direction, but the amount of traffic is so low that it would fit in one lane. Taking a travel lane away in each direction would help slow traffic and make room for on-street parking and bicycle lanes. Public input is essential, so please let us know your views. Government Center Parkway intersection would remain all-way STOP. If supported by the community, changes could be implemented during the 2014 construction season. If you have any questions, please call Ann Sharp at Supervisor Cook's offices, 703-425-9300. Today was the long awaited debut of Silver Line service to Reston via Tysons. 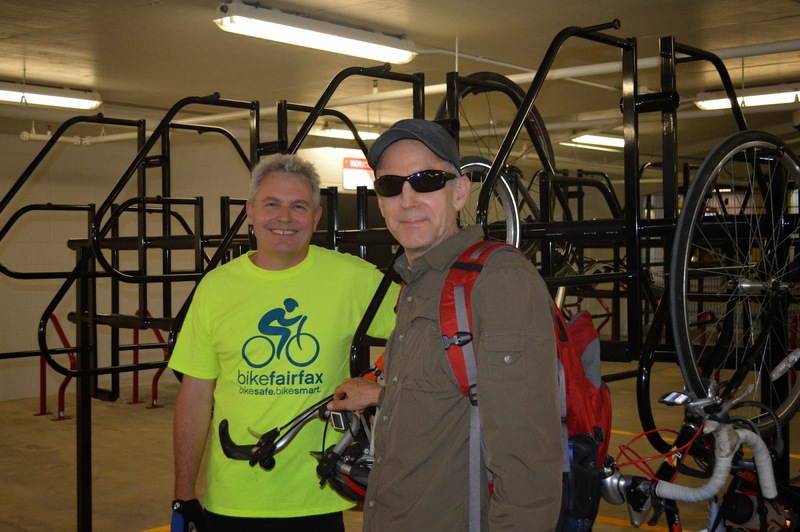 It was also the official opening of the Wiehle-Reston East bike room. We live about a mile from the Wiehle station so we headed over to try to catch a ride on the first train. 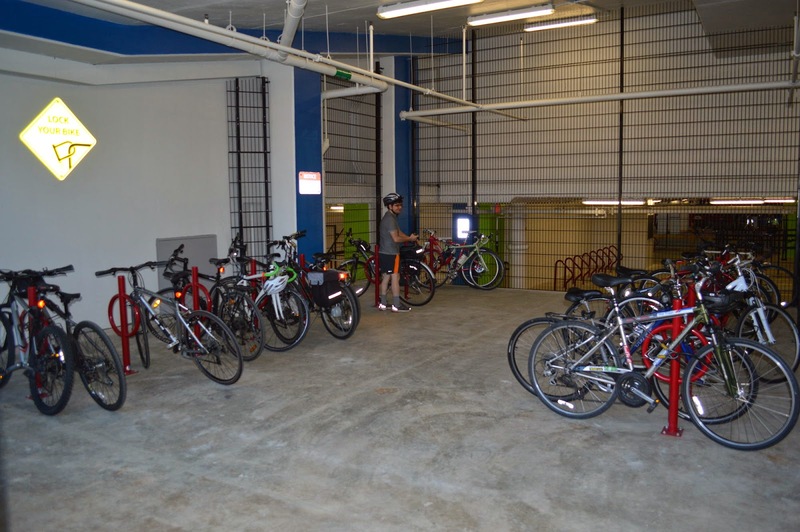 We parked in the bike room and noticed that most cyclists had parked at the free indoor bike parking located just outside the bike room. 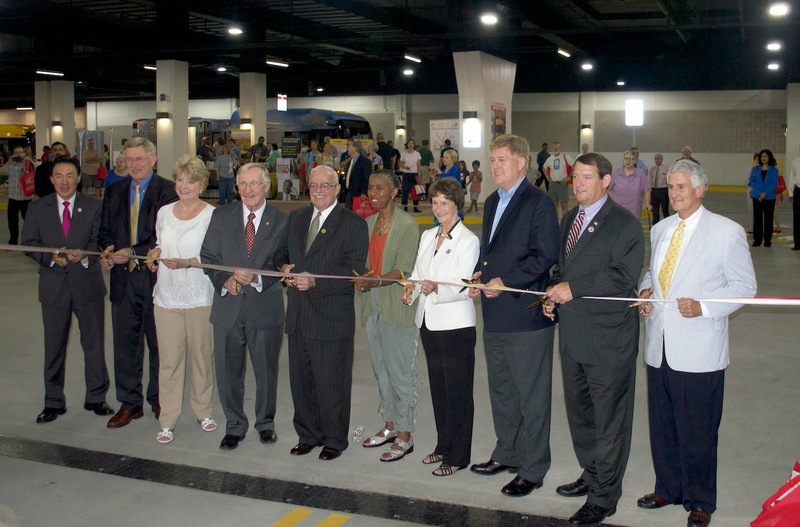 At around 11:30 a.m. the ribbon was cut at the south entrance to Wiehle station. Participants included US Department of Transportation Secretary Foxx, Virginia Governor McAuliffe, Congressmen Connolly and Moran, and several Virginia and Fairfax elected officials. The first train pulled out of Wiehle station shortly after noon. The cars were packed so it took a while to close the doors ("Please stand back to allow the doors to close.") Most of the luminaries exited at the Tysons Corner station. We rode to East Falls Church, then crossed the platform with about half the other passengers to catch the return train to Wiehle-Reston East. 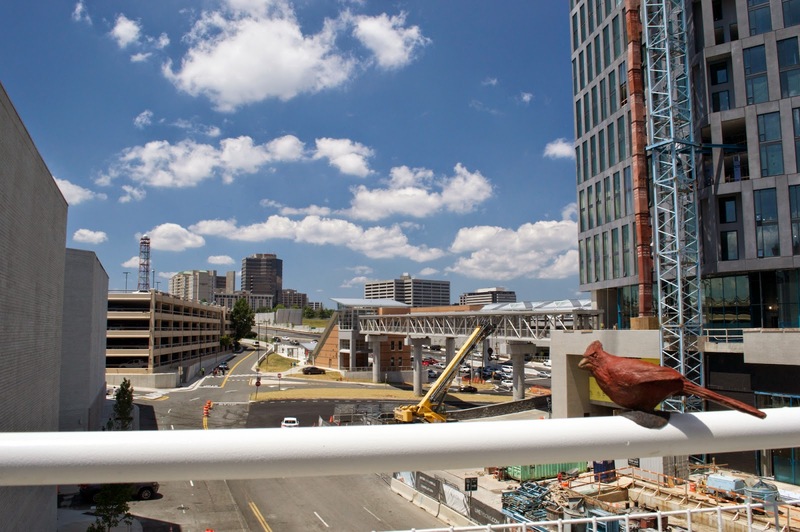 We exited again at Tysons Corner to check out the new Plaza at Tysons Corner Center (see construction camera). 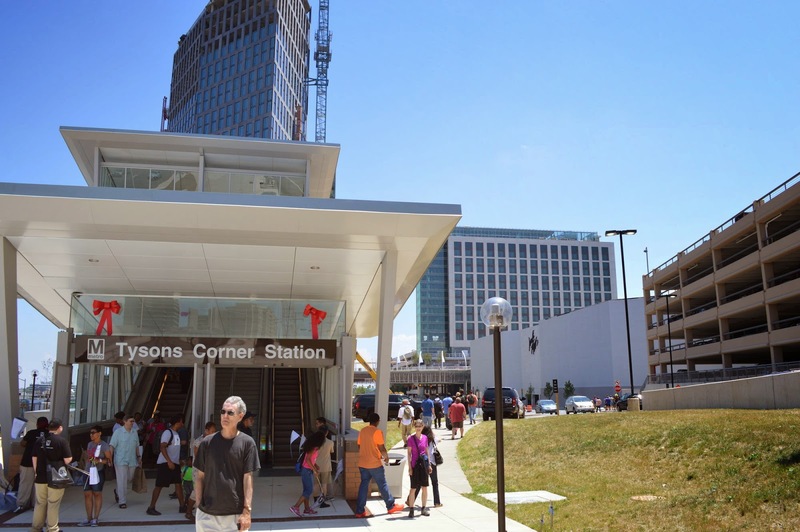 The direct connection from Tysons Corner station to the Plaza is not completed so we followed a circuitous route to street level then through Lord & Taylor. There were no bikes parked at the station racks but we expect them to get more use during the week. After lunch in Tysons we returned to Reston to retrieve our bikes from the bike room. The free parking was nearly full and there were a few bikes parked in the bike room. We saw several passengers with bicycles at the Tysons and Reston stations. Metro is a great way to extend your cycling opportunities in the metro DC area. Today was a major milestone for multimodal transportation in Fairfax County. It will be interesting to watch how travel patterns change over the next several years. We expect many more people in Fairfax to add Metro and biking to their transportation options. One common refrain about the Silver Line: “I don’t work or live out there, so I won’t be using it until it goes to Dulles.” But that’s a pretty limited way to look at the five newest Metro stops. Even if Tysons and Reston are nowhere near your regular 9-to-5 routine, there are plenty of other reasons to make the trip. We’ve developed a few potential itineraries — including a bike adventure, a night out and a shopping excursion — that will entice you to pull out that SmarTrip card. The article links to a map of some suggested routes to the Tysons stations developed by FABB members Pete and Liz. 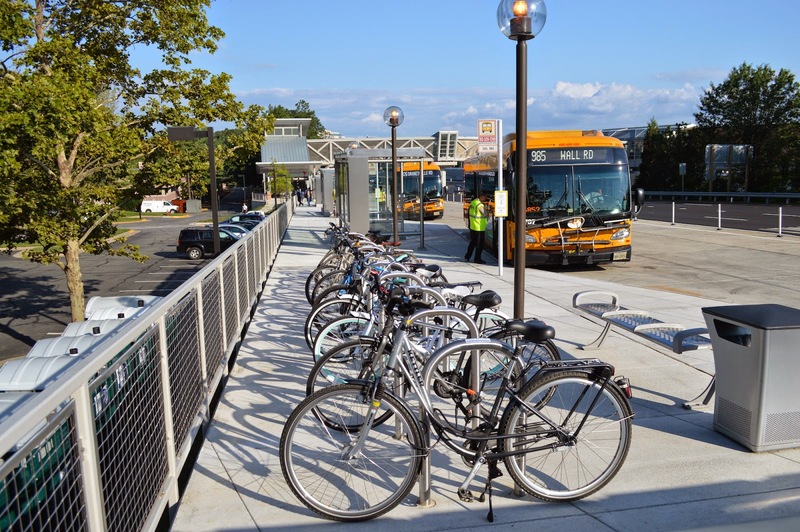 Check out our new page Bicycling and the Silver Line for more information on biking to the new stations and info about using bikes on Metro. There are links to the Tysons routes mentioned above in RideWithGPS that include cue sheets, along with a number of routes to the Wiehle-Reston East station mapped by the Reston ped/bike advisory committee using Bikely. The final draft of the Countywide Bicycle Master Plan is now available, including quadrant maps showing recommended bike lanes, shared lanes, trails, and other bike facilities. "The plan will determine what steps should be taken to improve the existing transportation system and make Fairfax County bicycle friendly." Before the Plan is adopted by the county, public hearings will be held at the Planning Commission on October 1 and Board of Supervisors on October 28. The first of three public meetings on the draft plan was held in Reston in June. Dates have not yet been set for meetings in the central and south parts of the county. FABB is encouraging cyclists to show their support for the plan by signing a petition that will be presented to the Board of Supervisors. FABB will lead rides to the public hearings to show our support for the Plan. The Fairfax County Board of Supervisors recently approved a list of projects to be included on the 2014 Transportation Bond referendum to be held this Fall. 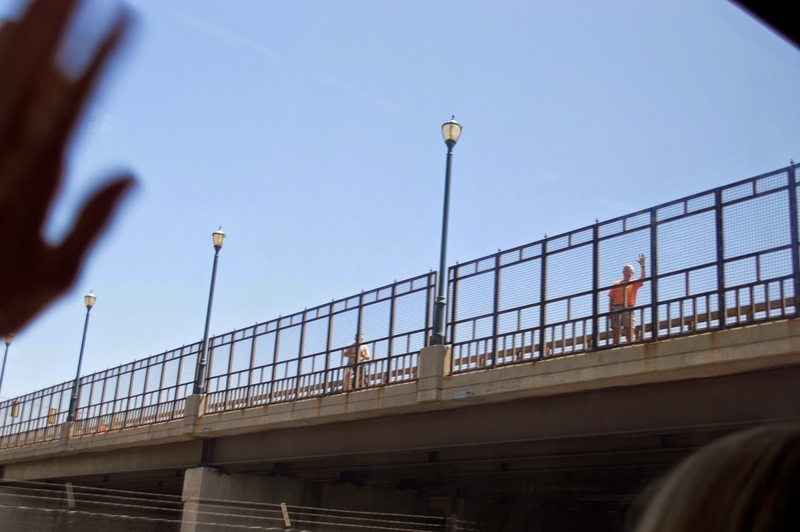 The Board is asking residents to approve $100 million in projects of which $6.5 million is for bike projects and $77 million for pedestrian projects. Because the county decided that most bike/ped projects are not eligible for funding with new state transportation funds, the majority of bond projects are bike/ped. The county plans to spend approximately $1.4 billion in transportation projects over the next six years. Bike funding in the bond is approximately 0.46% of $1.4 billion. See the complete list of the bond projects. We encourage county residents to support the Bond in November. Cyclists on trails should also take the three foot passing law into consideration when passing others. While experienced riders may be comfortable being passed by less than three feet, a margin of error should be allowed when passing anyone to allow for any erratic or sudden movements. The final results of the Reston Bike Share Feasibility Study were released at a meeting in Reston last week. The consultant, Alta Planning + Design, concluded that bike sharing is feasible in Reston. Phase 1 would consist of 13 stations with 130 bikes, all but one station located north of the Toll Road, with most in the Reston Town Center area. The station locations were determined based primarily on potential demand and the desire to reduce the space between stations. The cost of Phase 1 is estimated to be $1.2 million, of which $54K is for Launch (startup costs), $766K for Capital (cost of stations, docks, bikes), and $397K for Operating costs. The final report was delivered to the county on June 30 and the report will be posted on the county bike pages eventually. In the meantime see the FABB blog entry for more details. As part of VDOT’s summer repaving program, Courthouse Road from Route 123 to the Town of Vienna is being reconfigured to include bike lanes. Where the road is too narrow for bike lanes, shared lane markings are being used. Final pavement markings are now being installed. This is a popular bike route that runs parallel to Route 123 between Oakton and Vienna. Work continues on the Fairfax County Parkway Trail Repair project. Repairs were made between Route 7 and New Dominion Parkway in Reston. Work crews then moved south and will work their way north from Route 50. They are currently working between Tuckaway Drive and West Ox Road. Check the VDOT Parkway Trail Repair page for the latest status. 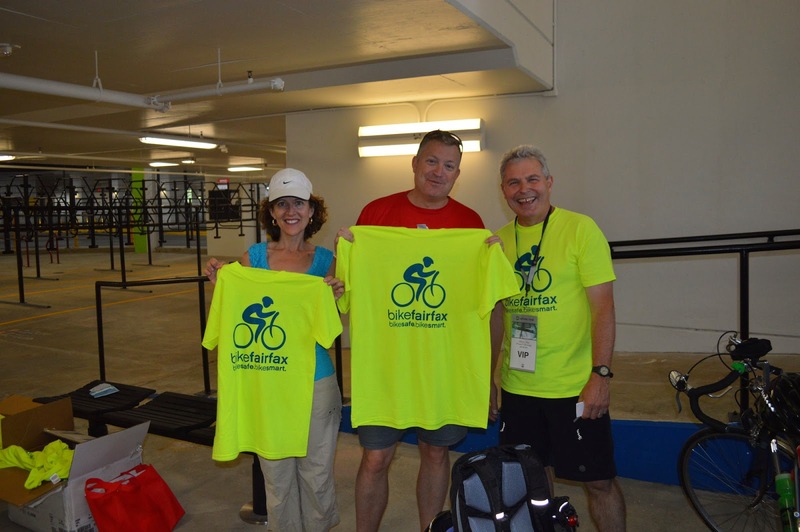 One of our special guests at the July 16 FABB meeting will be the organizer of Northern Virginia Cycle Fest, a series of mostly on-road rides in Fairfax and Arlington Counties. "The community is invited to the 5th Annual Northern Virginia Cycle Fest, Sunday, September 14, 2014. The ride, hosted by the Jewish Community Center of Northern Virginia (JCCNV), in partnership with its sponsors, is open to all experienced riders. Set in the fall, riders enjoy the fall temperatures and scenery through the hills of Northern Virginia. "Four ride options, departing at 7:30am, range from 11 to 62 miles. All rides originate and return to the JCCNV and are designed to be fun and challenging for riders of all levels and experience — with a suggested minimum age of 12. Riders should be comfortable riding on roads with traffic. All ride options are supported with rest stops, SAG vehicle support, mechanical support, merchant sponsorship and light refreshments. The 2014 ride benefits Wounded Warriors Project and Washington Area Bicyclist Association (WABA). 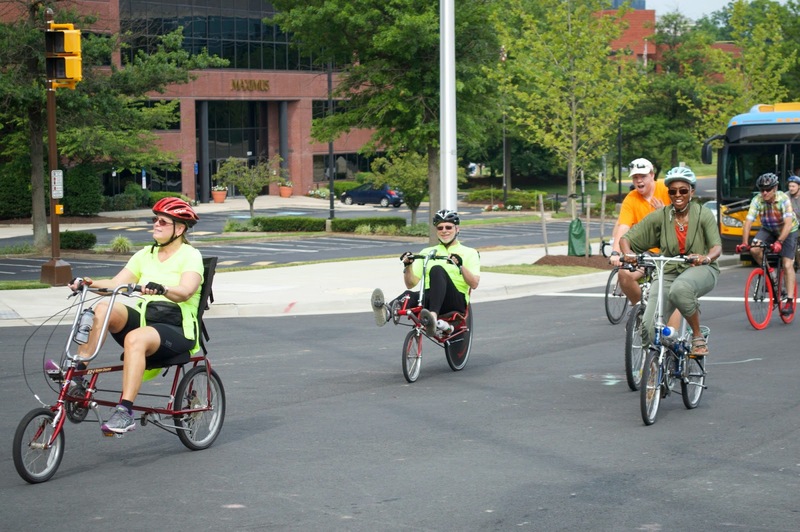 For more information, visit the Northern Virginia Cycle Fest website. Fee: $50/ $45 JCCNV members/ $20 active military and first responders." The final report on the W&OD Trail safety stakeholder meeting was recently released by the Northern Virginia Regional Park Authority. See our recap of the meeting. Recommendations that are considered feasible in the near future include Trail Signage, Trail Education for Motorists/Users, and Asphalt Treatments/Slow Zones. Now that summer has arrived, ozone levels tend to rise in the DC Metro area. Clean Air Partners is a regional air quality organization that offers AirAlerts, free, daily air quality notifications that inform recipients when the air quality forecast will be unhealthy and when it hits an unhealthy level (Code Orange or Red) in real-time. Service on the new Silver Line, serving Reston and Tysons, will begin on Saturday. 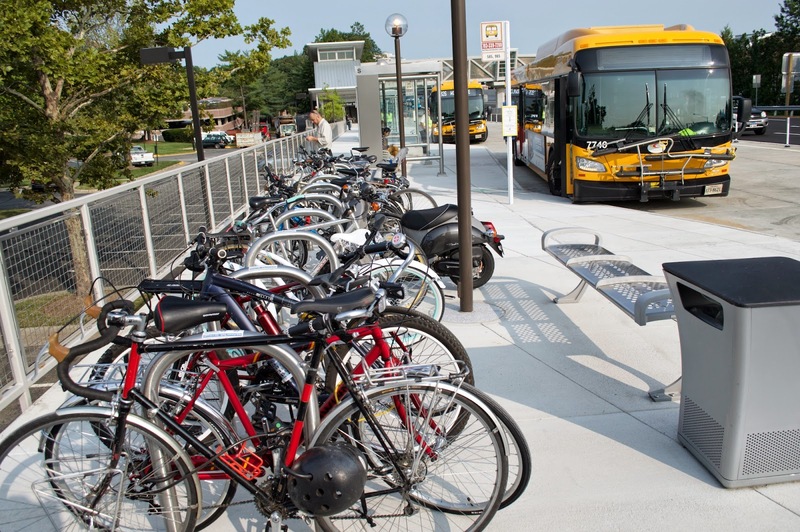 We've created a page of information about bicycling to each of the new Silver Line stations. 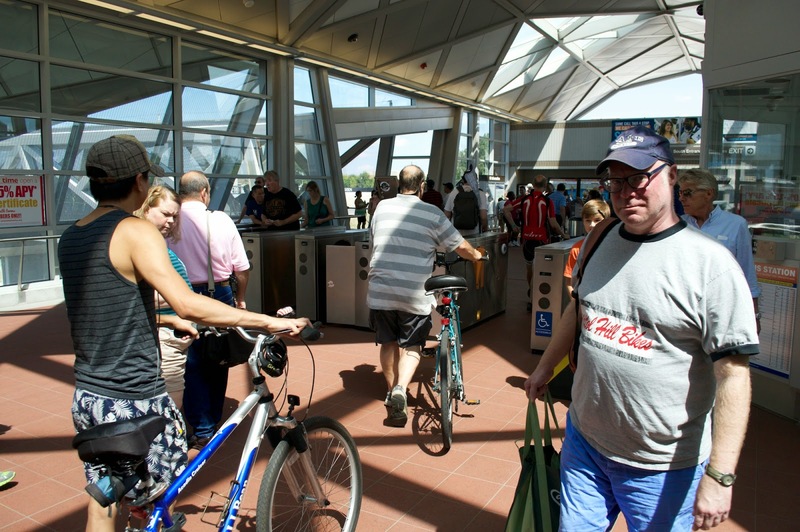 The page includes possible bike routes to the Wiehle and Tysons stations, information about bike facilities at each of the stations, and info about using bikes on Metro. 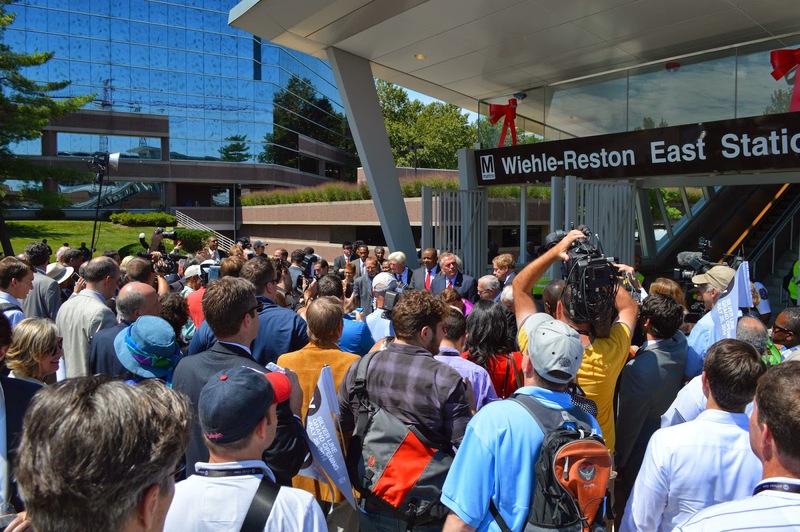 A ribbon-cutting ceremony will be held on Saturday, July 26 on the south side of the Wiehle-Reston East Station around 11am. The first train will depart from the Wiehle station at noon. 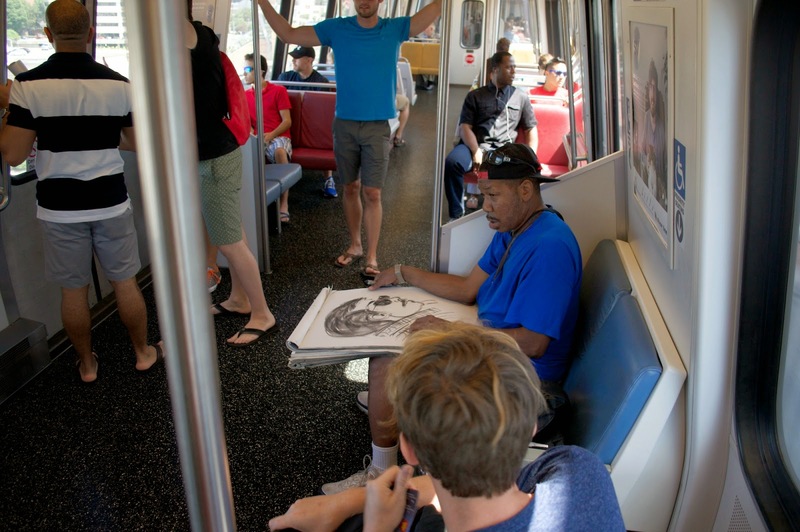 See the Silver Line Metro page for details about opening day activities. 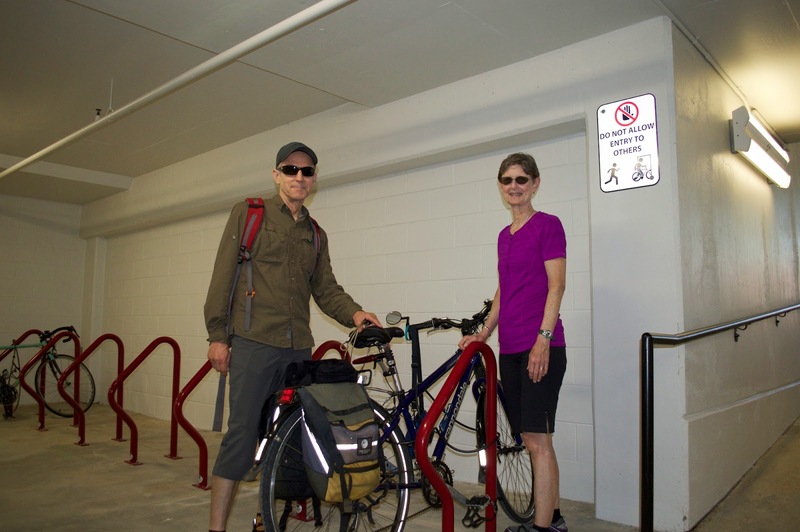 Based on the response to the Wiehle bike room open house, we expect many people will want to ride to the stations. Parking in the parking garage will cost $4.75 per day. 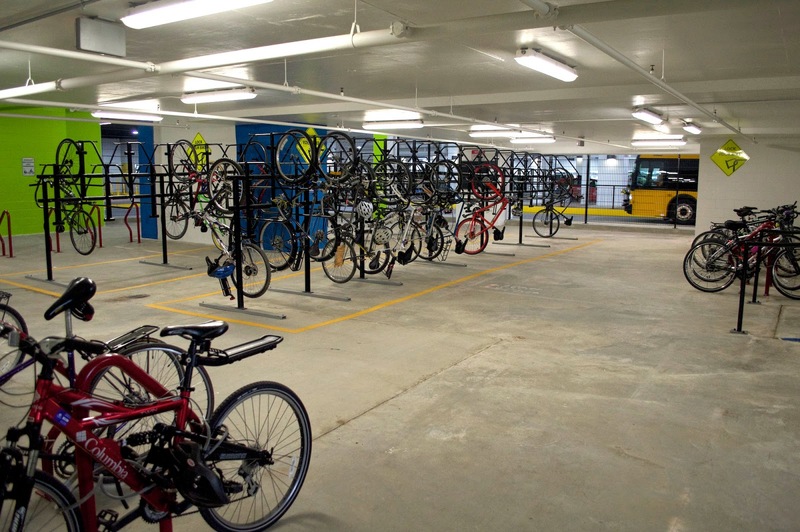 Parking in the secure bike room will cost $60/year plus a one-time fee of $15. Daily cost of the bike room, assuming someone would park M-F, is about 25 cents a day. It's your choice. 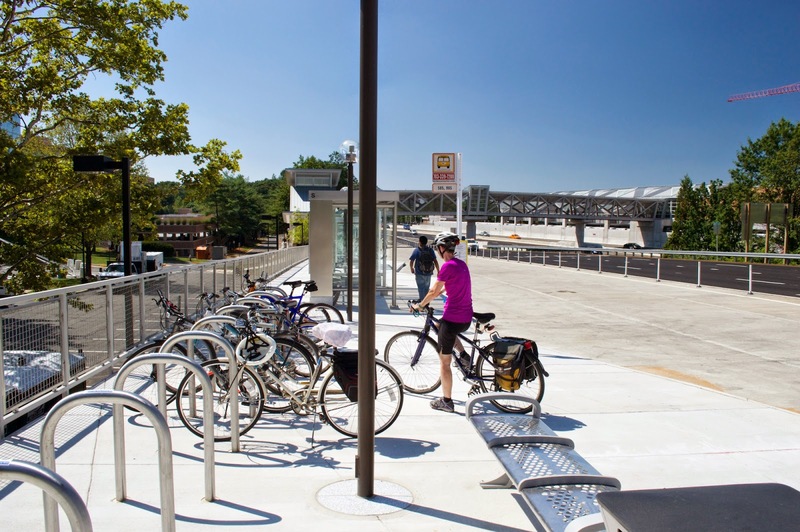 The Tysons stations will not have permanent car parking but each station will have bike parking. 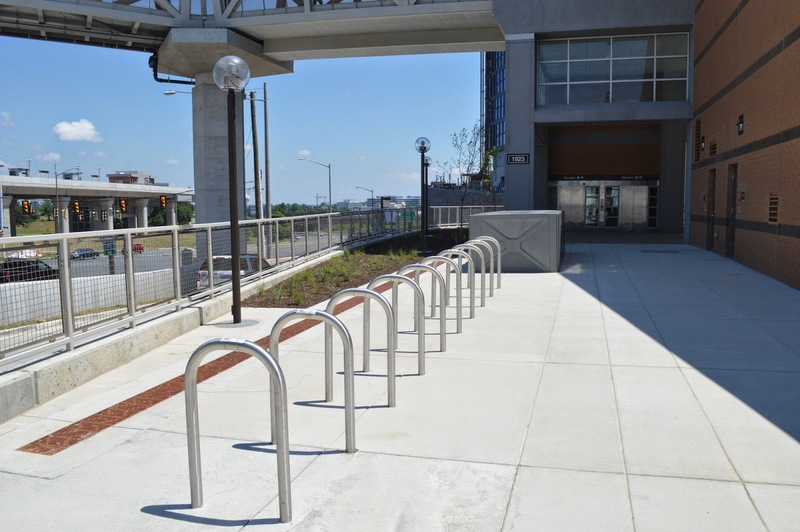 Bike lockers are located at the Tysons and Wiehle stations. Contact WMATA to reserve a bike locker. WMATA charges $120/year. The one exception is bike lockers located on the north side of the Spring Hill Station which are managed by Fairfax County DOT. The county bike locker fee is $60/year. We just learned that WMATA is not yet ready to rent bike lockers at the Silver Line stations. I received this message today from WMATA about renting a locker at the Greensboro station: "We are not ready to sign up [Silver Line] bike locker patrons. After this has taken place, I will email you." 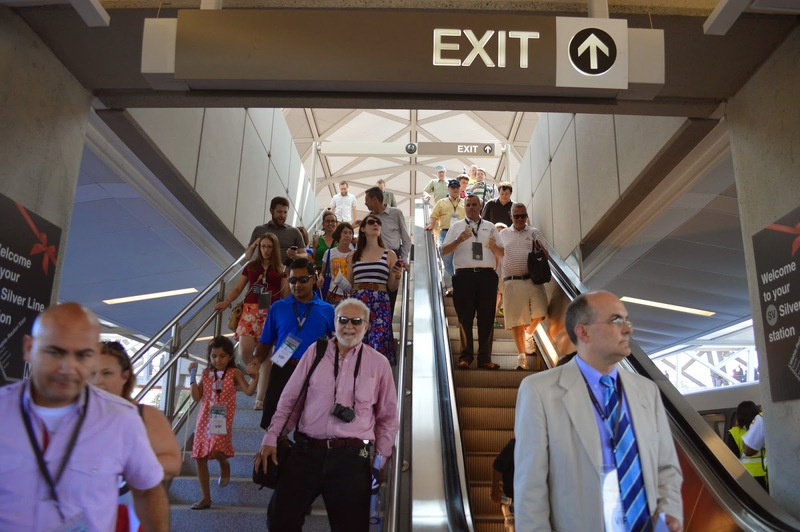 A large crowd checked out the Wiehle-Reston East Metrorail station bike room on Saturday. The day started with bike convoys converging on the station and then riding in together. Several local bike groups, including FABB, had information tables. A common question people had concerned what is the best bike route to the station from their neighborhood. People are excited they will soon be able to ride to the station to take Metro to Tysons and points east. from home and either park your bike for free or reserve a spot in the bike room for $60/year plus a one-time fee of $15. Others can leave their bike overnight and use it to get to their destination once they arrive on Metro. 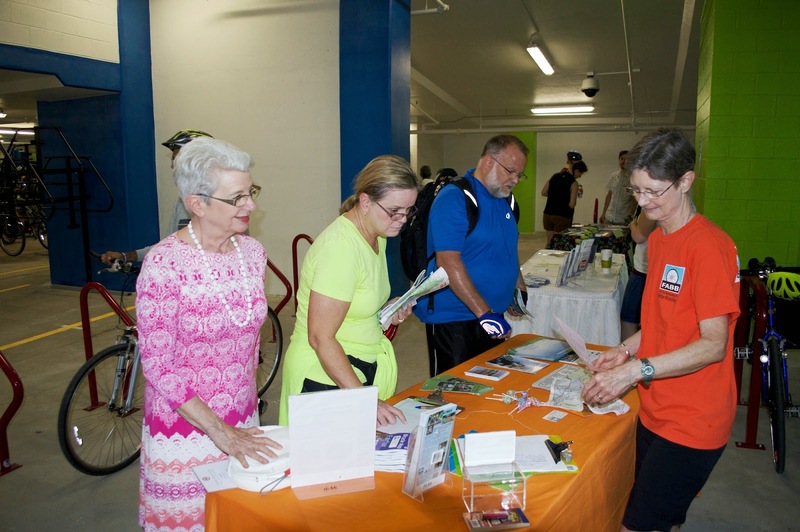 Several people obtained bike room memberships at the open house. So far, over 200 people have signed up. While there is currently space for just over 200 bicycles, the county will likely sell up to 300 memberships, knowing that not everyone will want to use the facility at the same time. spoke with someone yesterday who has lived in Reston for many years who has never taken Metrorail. Fairfax County hopes more people will consider leaving their cars at home and taking public transportation. Several bus route changes are planned, including more frequent service on some routes serving the new stations. The only permanent car parking will be at the Wiehle station, but bike parking will be available at all the stations. Bike lockers can be rented by contacting WMATA (except for the lockers on the north side of the Spring Hill station). We were asked by a few people if we were concerned about heavy traffic around the station. We'll be riding a bike, so while we will have to be much more careful at intersections around the station, we won't have to contend with most of the expected congestion. For detailed information about the Silver Line stations, visit WMATA's SilverLineMetro.com. According to a July 7th Stanford Medicine News article, "An examination of national health survey results suggests that inactivity, rather than higher calorie intake, could be driving the surge in obesity. Inactivity rather than overeating could be driving the surge in Americans' obesity, according to a study by a team of Stanford University School of Medicine researchers. (Obesity, Abdominal Obesity, Physical Activity, and Caloric Intake in U.S. Adults: 1988-2010) Examining national health survey results from 1988 through 2010, the researchers found huge increases in both obesity and inactivity, but not in the overall number of calories consumed. "'What struck us the most was just how dramatic the change in leisure-time physical activity was,' said Uri Ladabaum, MD, associate professor of gastroenterology and lead author of the study. 'Although we cannot draw conclusions about cause and effect from our study, our findings support the notion that exercise and physical activity are important determinants of the trends in obesity.'..." Two special guests will speak at FABB's July meeting to be held tonight, Wed. July 16 starting at 7:30 p.m. The meeting is held at Patrick Henry Library, 101 Maple Ave E, located a block west of the W&OD Trail. Officer Dan Romanoff will give a brief overview of the county bike patrol and discuss his experiences riding a bike in Fairfax. Allon Schiff will discuss the Northern Virginia Cycle Fest rides scheduled for Sunday, September 14. This event is one of the few that does not rely primarily on the W&OD Trail. Cyclists will explore the neighborhood streets of Fairfax County on these fully supported rides. Interested cyclists are welcome to attend the FABB meeting. Wednesday, July 16, 2014, 7:30 p.m. 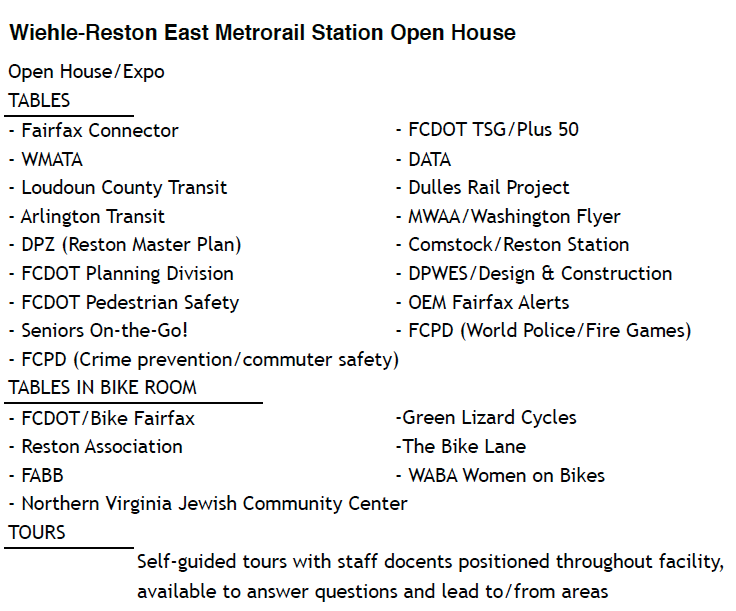 Check out the new bike room at the Wiehle-Reston East Metrorail station garage open house on Saturday, July 19. A ceremony will be held at 10 a.m. FABB and other local groups will have information tables. If you have questions about routes to the station, stop by the FABB table. The event is scheduled to end at 3 p.m. The key-entry bike room has space for over 200 bikes. Just outside the bike room is free, covered bike parking. The bike room contains "Two 'fix it' stations featuring a work stand, an assortment of commonly used bike tools, and an air pump." We've heard that several neighborhood groups are riding in convoys to the station from several locations around Reston. They plan to meet at the North Park and Ride lot at the intersection of Sunset Hills Dr and Wiehle Ave at 9:15. There will be a procession from there across Sunset Hills Dr to the parking garage. 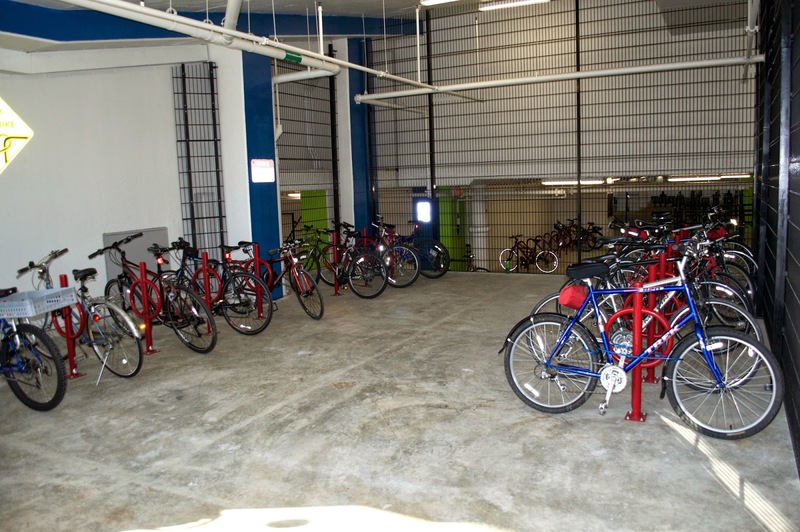 See other FABB blog entries about the bike room. 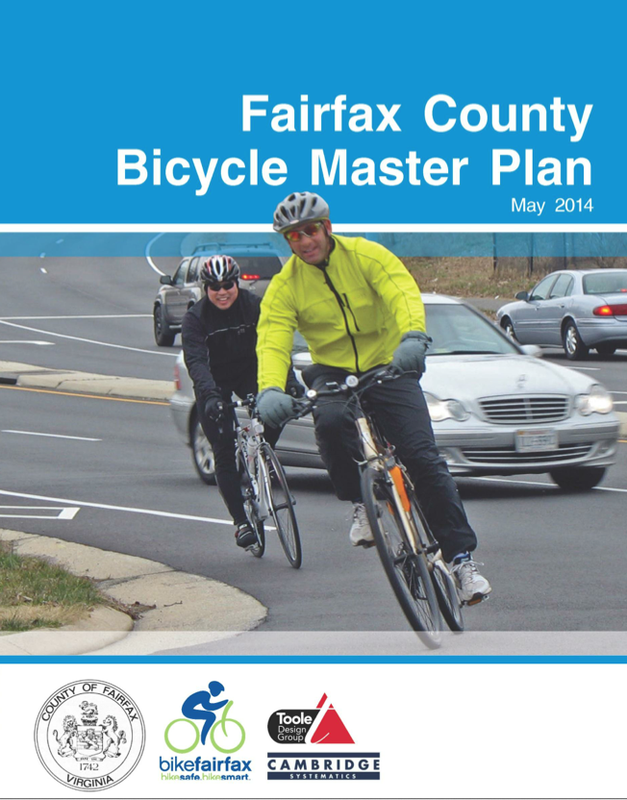 The final draft of the Fairfax County Bicycle Master Plan is now available on the county website. Phase I of the plan was the Tysons Bicycle Master Plan that has since been incorporated into Phase II. Also included are four quadrant maps showing recommended bicycle facilities. Public hearings on the Master Plan will be held before the Planning Commission on October 1 and the Board of Supervisors on October 28. FABB will be leading rides to the public hearings to show support for the Plan. FABB is encouraging all county cyclists to support the Plan by signing the Bicycle Master Plan petition. We'll be posting more info about upcoming bike plan meetings. Meeting the safety, access, and mobility needs of bicyclists today, while encouraging more people to bicycle in the future...making Fairfax County bicycle friendly and bicycle safe. Develop a safe and connected network of on-road and off-road bicycle route options (shared-use paths and trails), and other supporting infrastructure, that serve all communities and destinations. This network will consist of shared-use paths, select sidewalks, park trails, neighborhood streets, and collector, arterial, and primary roadways as well as signed routes, bicycle parking facilities, and integration with public transit. Plan, develop, design, construct, and maintain new facilities and accommodations, and upgrade existing facilities to safely and comfortably serve all bicyclists from 8 to 80+ years of age when cycling for transportation or recreation purposes. Increase bicycle use for transportation, especially for non-commute trips, which account for approximate 75 percent of all transportation trips. Establish and track annual progress towards goals for bicycle travel demand and provision of bicycling infrastructure as identified in the Plan. Increase actual bicycling safety and the perception of safety for bicycling on roads and trails in Fairfax County. 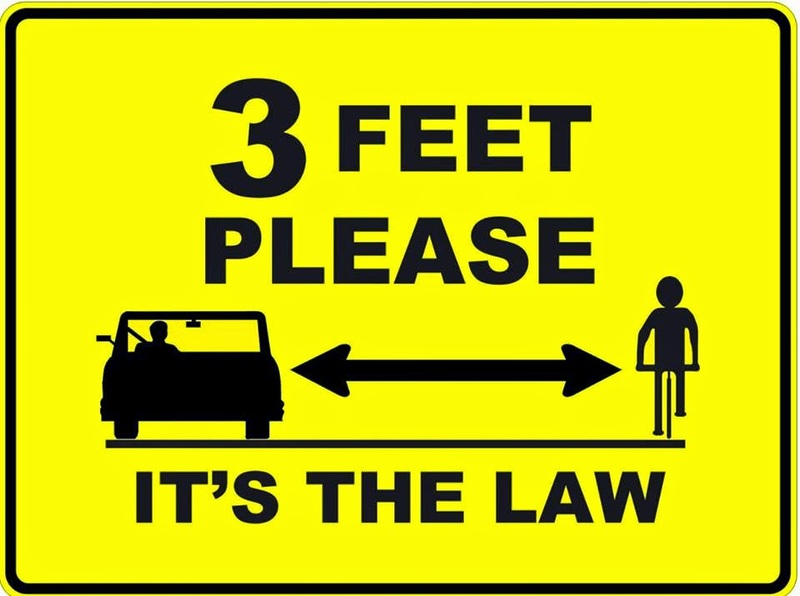 Beginning today Virginia motorists (or more specifically "Any driver of any vehicle") are required to allow three feet when passing a bicyclist. Virginia code 46.2-839 was modified in the 2014 legislative session. As of today the code text had not yet been modified. Cyclists on the trail should also take the three foot passing law into consideration when passing others. While experienced riders may be comfortable being passed by less than three feet, a margin of error should be allowed when passing anyone to allow for any erratic or sudden movements.